Rocky Mountain School of Animal Acupressure and Massage offers a wide range of courses in animal massage, acupressure, reiki, essential oils, animal communication and more. Rocky Mountain School of Animal Acupressure Massage has two locations at the base of the Rocky Mountains and one in Florida. All campuses are inspirational settings for learning the art of massage and acupressure for animals. Bring your dog or work on one of ours, practice on one of our friendly horses and make new friends. Approved and Regulated by the Colorado Department of Higher Education, Division of Private Occupational Schools and the National Certification Board for Therapeutic Massage & Bodywork (NCBTMB) as a Continuing Education Approved Provider # 451073-09, RMSAAM also offers Continuing Education through the Registry of Alternative and Integrative Veterinary Medical Education (RAIVE) Provider # 2013-4. These approval processes are a part of our continuing effort to provide high quality educational programs at the Rocky Mountain School of Animal Acupressure and Massage. We are dedicated to upholding the highest standards of practice in the industry. For this reason, students seek out our program from around the country and around the world. Why Should I Choose Rocky Mountain School of Animal Acupressure And Massage? Rocky Mountain School of Animal Acupressure and Massage offers a wide range of courses in animal massage, acupressure, reiki, essential oils, animal communication and more. We are proud of our offerings and our legacy. All RMSAAM faculty members are educated professionals with extensive training, fieldwork and teaching experience. Additionally, we require all of our instructors to be credentialed by the state of Colorado as teaching professionals. Each teacher brings their own experiences and approach to the classroom while abiding by RMSAAM's strict set of teaching standards and curriculum to create a dynamic environment, consistent program and the highest of standards for our profession. When you join the RMSAAM community, you become part of a supportive and professional group of practitioners who are passionate about their practice and the well-being of animals. Join us for 4-7 days on site per level, our course calendar is designed to allow you to take each level back to back, as we have many students who travel in from out of state or out of country. For each level your time will be divided between classroom and lab settings and the small class sizes allow you to receive feedback from the instructor and fellow students while you are learning. Our knowledgeable instructors will guide you through the curriculum and the practical application of animal massage and acupressure. 5 Days in Elizabeth, CO per level..
Building and Marketing Your Practice. Includes Confidentiality, Developing and Maintaining Records, Preparing Case Histories, Developing Case Studies, Marketing Strategies and Insurance. Pathologies - Gait Observation and its Relation to Muscle Imbalances and Abnormalities. Common Equine Diseases. Discuss Medications, Nutrition, and Treatments both Holistic and Modern. Horse Handling - Behavior, Communication, Intention and Barn Safety. Introduction to Acupressure, Essential Oils, and Nutrition. In Depth Equine Anatomy and Organ Systems. Introduction to Kinesiology. Introduction to Reiki, Color healing, Sound Healing, End of Life Decisions, Plants and Essential Oils, etc. 4 Days on-site per class in Elizabeth, CO or Cape Coral, FL. Building and Marketing Your Practice. Includes Confidentiality, Ethics, Developing and Maintaining Records, Preparing Case Histories, Developing Case Studies, Marketing Strategies and Insurance. Pathologies - Gait Observation and its Relation to Muscle Imbalances and Abnormalities. Common Canine Diseases. Discuss Medications, Nutrition, and Treatments both Holistic and Modern. Animal Handling - Behavior, Communication, Intention and Pack Psychology. In Depth Canine Anatomy and Organ Systems. Introduction to Kinesiology. Specific Massage Techniques that Assist the Immune System, Help Reduce Pain and Inflammation and Maintain Range of Motion. AAT - This is our Animal Acupressure Therapist Program. This program is the study of Traditional Chinese Medicine and is an excellent stand-alone program or as an addition to any of our massage programs. This program has two levels of expertise. AAAMT - This certificate, Advanced Animal Acupressure and Massage Therapist, is achieved by earning an on-site Level 3 Massage certificate in addition to earning an Acupressure Level 2 certificate. 7 days on site per level in Longmont, CO. Landmark Anatomy of Equine and Canine - Partial self-study required prior to class. Register at least 2 weeks prior to give yourself time to complete the work. This class takes place at an equine facility in Longmont, CO. Work will take place on horses and dogs. Once again I have had a great experience. I love RMSAAM and all the people involved with the school. The way the class was structured, I felt I improved my technique every day, which was wonderful. I loved that there was such a variety of horses to practice on as it enhanced my experience. I am so glad to have found RMSAAM. Seeing the dog relax and their eyes roll back and getting them to sigh during the massage, brought a smile to my face. It was a wonderful experience to able to work on such a variety of dogs, large, small, active, sedentary etc. It was a great opportunity to experience canine massage. The instructor, Shelley Sheets was fun, positive, extremely knowledgeable, passionate and had great energy. I loved the quizzing and drills to help us remember the material. Can't wait for my next class. I learned so much about horses and horse massage. The class exceeded my expectations. As a result of the class I have become a much better horse person. 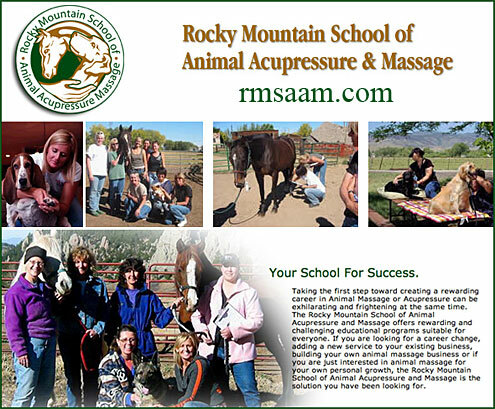 Get Started With Rocky Mountain School of Animal Acupressure and Massage Today! If you are looking for a career that offers you the chance to manage your own schedule and work with animals every day then RMSAAM is the school and the opportunity you have been waiting for. Join our thousands of graduates who have gone on to start active and rewarding businesses with animal acupressure and massage. For more information about all of the programs we offer and to get started, please call us today!